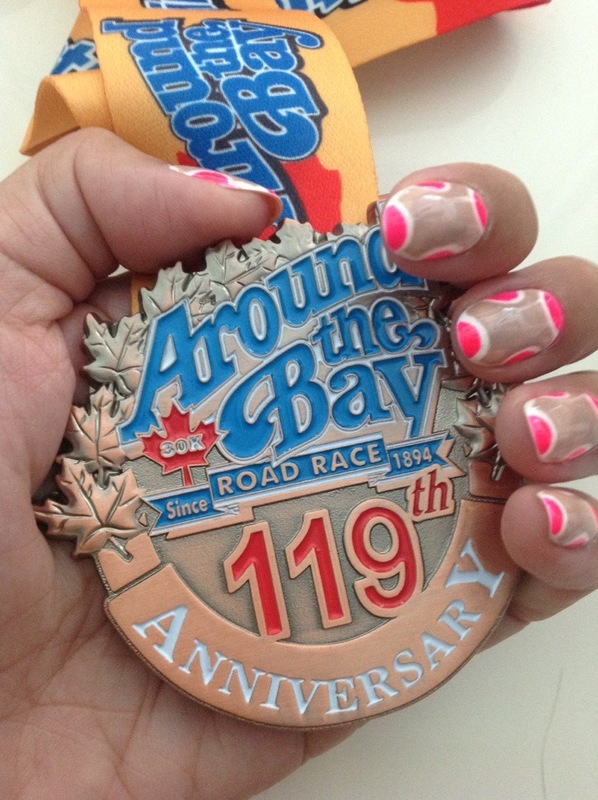 On Sunday, I faced my (race) demons and ran Around the Bay 30k race in Hamilton, Ontario. Have I mentioned how excruciating it was the first time I ran it in 2009? It was cold and rainy (possibly hailing at one point — I’ve done my best to block out as much of it from my memory as possible). I also believe I then had an undiagnosed thyroid condition (I was diagnosed later that year) that I think was at the root of making my muscles extremely tired quickly. I remember wanting to cry, and not knowing what to do if I happened to come across a medic along the route. The temptation to just stop was great, but at the same time I’d suffered the race thus far, so why not finish it. So I was extremely anxious about running this hilly race again, but decided it was something I had to do. And I’m thankful I did, because this year’s race was the complete opposite. I felt strong from start to finish (I don’t think I’ve ever felt that way in a race longer than 10k ever! ), the weather was perfect (generally sunny, and about 0 Celsius — just cold enough). I was in Barbados all of the week prior to the race. And you shouldn’t really change much in your diet or schedule before a race, but I think being away may have helped in one respect: I normally spend the week religiously checking the weather forecast, changing my mind a million times about what to wear for the race, basically stewing and growing more anxious about the race. Being away, it wasn’t on my mind that much at all. The rolling hills that start around 18k? Nothing insurmountable. The biggie at around 25k, that one’s a doozy, and I happened to be at a walk break halfway up. Some runners will complete the hill and then take the walk break, but I had no interest in being a superhero and took my 60-second walk break. The major disappointment? Just before the 9k mark, I was delayed by a darn freight train that took close to five minutes to pass. I thought I had to kiss my goal time of sub-3 hours bye-bye (on my chip time anyhow), but I paused my Nike Running app, and just became more determined to make my chip time still less than 3 hours…and I did it! Which in actuality means I crushed my goal time, and finished just under 2:55. Go me! Around the Bay next year (fingers crossed no train crossing)? Maybe, just maybe! Next goal? Vancouver Marathon, May 5th! P.S. Where is the bacon station that I’d heard about?! I sure didn’t see it! Congratulations! I only did the 5K but it was fun being part of such a large event. Thanks! Congrats on your 5k race! How’d it go?? First race of the season, so a mediocre 31:00. Harry’s Spring Runnoff 8K and a slew of 10Ks booked. Great! Decided to not run Harry’s 8k this year (mostly to save $ since off to Vancouver for that marathon). Have a great race season! Happy running!